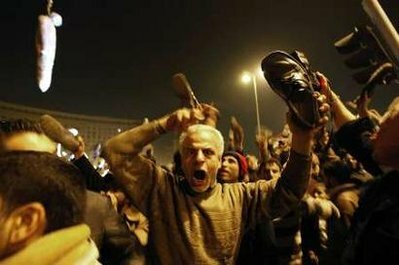 Meanwhile, major violence broke out at Tahrir Square today. Major violence has broken out between pro and anti-Mubarak protesters in Cairo’s central Tahrir Square, with demonstrators throwing stones at each other as soldiers atop tanks looked on. Thousands of protesters from both sides were in the square, the epicentre of opposition demonstrations now in their ninth day. Several groups were involved in fist fights and some were using clubs, reports said. Of course, the media is reporting that the instigators were pro-Mubarak protesters not the Islamists. More… Men on camels and horseback just charged into the crowd. They’re whipping people. Men on horseback and camels charged into the crowd at Cairo’s Tahrir Square, some of them lashing people on the ground with whips. Several were pulled off their animals and beaten, and the others retreated. CNN’s Ivan Watson said the horseback riders came from the pro-Mubarak side of the demonstration. Gee. What are the odds that the Muslim Brotherhood had something to do with this?